Advanced English Dictionary app for Windows 8 is available under ‘Books & Reference’ section of its app store. It’s a comprehensive Windows 8 English dictionary app that brings you over 200,000 words with the definition, synonyms, antonyms, and pronunciations. You can easily view recently searched words under the ‘Recent’ column, and also send word to your favorites by clicking on the star icon given at the top. All the words that you have marked as your favorites, can be seen under ‘Star’ column given at the left side of the screen. This English dictionary app for Windows 8 has been crafted and designed after keeping Windows 8 design language in mind, has modern UI and it very subtle. The Windows 8’s Search Charm is integrated with the app, hence you can easily search for any word you want. 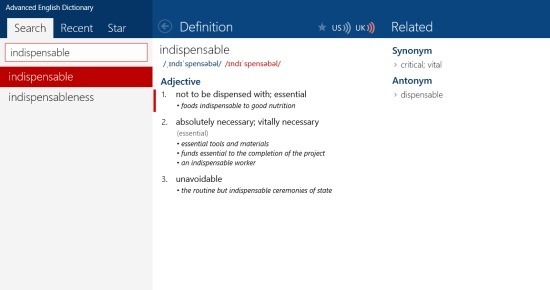 Let me quickly point out the main features of this English dictionary Windows 8 app below. Brings you over 200,000 words with the definitions, synonyms, antonyms, and pronunciations. Lets you view recently searched words under ‘Recent’ column given at the left side. Lets you add words to your favorites by clicking on the star icon given at the top. Live tile displays the recent words and top 2 starred words. Brings you relevant details including sample sentences, hyponym, hypernym, antonym, and synonym. It’s really fast to search for different words. I really found this English dictionary app for Windows 8 useful as it really fast to access and comes with all the possible details you would expect to know when you look for a word. Its very easy to download Advanced English Dictionary app in Windows 8. Also, check out our posts on Language Translator Apps, Dictionary Apps, and Spelling Apps. Open the link in IE10 and click on ‘View in Windows Store’. You will find the app opened in Windows 8 App Store from where you can now install it by clicking on ‘Install’ button. In short, Advanced English Dictionary app is a good utility app to look for any type words, their definitions, synonyms, antonyms, sample sentences, hyponym, and hypernym. Go ahead and download Advanced English Dictionary app in Windows 8 now. This is a great app. I used it a lot when writing a screenplay recently.